Helping patients resolve chronic health issues for over 40 years. Many years before natural health care came into vogue, decades before the current fad of physicians (after attending weekend seminars) began calling their practices confusing titles such as “anti-aging medicine,” “functional medicine,” “integrative medicine” or “complimentary medicine”… before Dr. Oz and other media generated gurus… prior to all this a Clinic was established where the focus was on the reversal of chronic diseases by addressing their causes… The Goldberg Clinic. The Goldberg Clinic is an institution whose history evolved out of one person’s quest to help others reverse their chronic disease conditions after successfully doing so himself. A clinic with the knowledge and experience to uncover the causes of chronic illness and develop individualized programs meeting each patient's specific needs. Having experienced the agony of debilitating chronic illness, Dr. Goldberg and the Goldberg Clinic today assist others reverse degenerative disease conditions, as he did for himself four decades ago, in a logical manner combining the best of science and nature. To assist those who have lost hope of regaining their health return to an active, comfortable, life and take control of their destiny. Pain and disability are dependable motivators. Dr. Goldberg as a young man had a large dose of both these goad him into action. In his early twenties he developed excruciating joint pains throughout his body accompanied by oppressive fatigue, ulcerated bleeding bowels and perfuse muscular pains. A competitive swimmer and bicyclist who relished an active lifestyle, he was devastated by increasing physical disability. This was compounded by his being engaged at the time in a joint degree program in Law and Preventive Medicine at Ohio State University. He was alarmed by what physicians told him: he had …”Rheumatoid Arthritis, Ankylosing Spondylitis and Ulcerative Colitis”. In 1975 the medical outlook for these diagnoses, like today, was gloomy. He was hospitalized and told that steroids, painkillers and the possibility of removing his colon were his only options. A gloomy future of disability, he was told, would be his fate. Unwilling to accept such a dark future and after ten miserable days in the hospital, the future doctor began his quest for answers. Somehow he had gotten into this mess and he believed, there was a way out of it…if he could find it. He consulted with numerous medical physicians including those who labeled themselves “holistic”, to Osteopathic and Chiropractic Physicians, to Herbalists, Oriental Medicine Practitioners, Naturopaths and “Nutritionists.” He read medical texts, health store books and went to all types of health and disease lectures. In turn he received a myriad of herbs, therapies, supplements and remedies meant to “treat” his disease. As in standard medicine the emphasis was still on treatment of the manifestations of disease as opposed to addressing the causal factors that led to the disease. Dr. Goldberg discovered that the “treatment” of symptoms whether by steroids or by willow bark, by antibiotics or by herbs, whether the practitioner calls themselves a “standard, alternative, complementary, integrative, functional” or other often misleading titles, still focused on treatments rather than identifying and addressing causes. Discouraged, Dr. Goldberg nonetheless continued his quest and was rewarded for his perseverance as a more rational approach to understanding health and disease gradually became evident to him. By chance, while looking through an old bookstore, he came upon writings of Drs. John Tilden and Herbert Shelton, introducing him to Natural Hygiene a philosophy of health based upon understanding man’s biological requirements. Natural Hygiene helped Dr. Goldberg understand how disease evolves when our biological needs are not met and conversely how by creating the right health promoting conditions for the individual, health can be restored. Soon after, on a bitterly cold December Night, Dr. Goldberg drove out of Columbus, Ohio and ventured to the West Coast of Florida to a Natural Hygiene Institute. He was accepted as both a student and staff member and remained there for one year. Here he witnessed first hand how seriously ill people, living in accordance with Natural Laws, could restore their health utilizing viz medicae naturae, i.e. the healing power of nature. He saw the reversal of so called “incurable” diseases, not through treatments but by creating the right conditions of health via sunlight, dietary guidance, fasting, rest, sleep, emotional counseling, pure water and congenial surroundings tailored to the needs of the individual. In less than a year he found his way back to dependable health and developed such a devotion for his new knowledge and the seriously ill guests that came to the Institute that he was given the position of Health Director of the Natural Hygiene Institute. 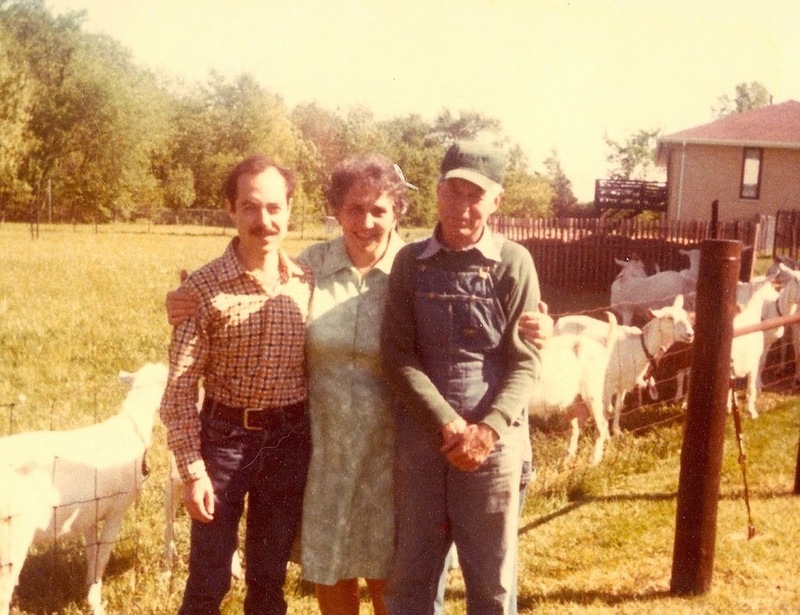 At a Goat Dairy Farm in Peoria Illinois, 1979. Working for the State of Illinois and the Federal Government as a Health Planner/Epidemiologist. A year at the Natural Hygiene Institute and the opportunity to witness how the right conditions could restore health to “incurables” while seeing his own health flourish, prompted Dr. Goldberg to continue his academic studies in the field of Chronic Disease Epidemiology. In 1977 he was accepted for a U.S. Public Health Service Grant at the University of Texas where he undertook studies in chronic disease control/ epidemiology to further understand the origins of chronic diseases. Writing his thesis on “A Biolistic Approach to Rheumatoid Diseases” he graduated and was recruited by the Federal Government as a Health Planner, focusing on the increasing incidence of mental and physical disorders in the population. Leaning against front counter of the Goldberg Clinic circa 1983 in Fairmount, Georgia. This was the first location of the Goldberg Clinic and was located in Gordon County. Fairmount is a town of about 880 people. The clinic was opened there in 1983. While helping communities develop strategies to combat increasing disease in the population, Dr. Goldberg yearned to work with individuals suffering from chronic diseases and help them find renewed health as he had done for himself. He was hired as an Instructor at a Chiropractic College in Atlanta to teach Clinical Nutrition and Public Health while given the opportunity to work towards a Doctor of Chiropractic Degree. Rising to the rank of Full Professor his college affiliations and published articles on chronic disease reversal opened many doors and he became a sought after speaker on the topic of chronic disease reversal particularly in the areas of autoimmune/rheumatoid diseases, allergic problems, gastrointestinal disease, diabetes and cancer. With the opening of The Goldberg Clinic for the Reversal of Chronic Diseases in 1983 (see photo), Dr. Goldberg became fully engaged as both health care practitioner and professor. Since that time he earned two diplomats in clinical nutrition, taught over 25,000 students and practitioners and brought thousands of patients with “incurable” diseases back to good health. In 2012, the Goldberg Clinic was fortunate to bring on board Dr. David Tener, our associate doctor, who has mentored under Dr. Goldberg since 2010. Valedictorian of his graduating class with degrees in Psychology and Chiropractic. Dr. Tener has developed exemplary talents as a Doctor of Chiropractic, as a Clinical Nutritionist, and as a caring human being ready to listen carefully to and assist our patients. A key element in the evolution of the Goldberg Clinic and its approach to health and disease is the concept Dr. Goldberg began to employ early in the clinic’s history, which he refers to as Re-Creation™. Over the decades the Goldberg Clinic has developed and refined ways to optimize the catabolic/anabolic process so that patients literally go through a metamorphosis of breaking down older, inferior, tissues and replace them with new, more vital and healthy body tissues… transforming their health and creating new and healthier bodies. Many of the clinic’s before and after photos of patients (as seen on this website under "Success Stories") show the metamorphosis that takes place with patients, not only experiencing relief from disease symptoms but looking and feeling younger with dramatically improved skin and muscle tone, brighter eyes and an overall look and feel of total body rejuvenation. Unlike other clinics where nutrients and therapies are forced upon old tissues (like taking your car for an oil change and having the technician pour new oil in without first draining the old oil first) the Re-Creation™ process, developed by the Goldberg Clinic, allows for the breakdown of old, inferior tissues that have contributed to disease and their replacement with new, healthier tissues allowing for a renewal of health. This represents the Art and Science of Clinical Epidemiology, Nutritional Biochemistry and Natural Hygiene all merged into an individual approach for each patient. Today, forty years after Dr. Goldberg’s journey back to health began, the Goldberg Clinic is a beacon of hope to those with chronic health issues seeking to begin their road back to health. No magic pills or therapies but rather serious investigation as to the causes of ill health and the construction of an individualized program to help them recover their health. Today patients come from across the United States as well as internationally, to work with us in the restoration of their health. In 2013 The Goldberg Clinic opened our education center, Hygieia, located in Brooks, Georgia. Located on ten acres of beautiful land, Hygieia is used, in addition to the Clinic in Kennesaw, as a health education center, as an organic garden and as a retreat for our patients. 1) Every person is an individual with unique biochemical, nutritional and emotional needs. We believe in the concept of biochemical individuality as originally presented by Roger Williams Ph.D. We adhere to the concept that the development of a recovery program must be tailored to the patient, not the patient to the program. 2) Disease symptoms are manifestations not causations. The causal factors behind the disease symptoms must be addressed if patient recovery is to be achieved. Patients are not the name of their diseases. 3) It is the doctor’s duty to help the patient identify the causes of their health issues by doing an in depth case interview, a physical examination and appropriate laboratory testing. This requires time and at the Goldberg Clinic a generous amount of time is allotted for each patient to spend with the doctor so that a comprehensive understanding of their condition can be achieved. 4) A doctor is a teacher not simply someone who treats symptoms. The causes must be carefully identified and the care skillfully administered. The care must match the cause. 5) The doctor’s goal is to identify the causes that led to the patient’s problems, to help the patient address those causes and to recover their health to the fullest degree possible. An important goal of the Goldberg Clinic is to empower the patient to make health care into self-care... to assist the patient to gradually become independent of the doctor. 6) Reliable health comes from understanding and addressing the causes of our diseases at the source. This is done not by “treating” disease but rather by providing the right conditions of health for the patient so they may be nurtured back to health. 7) The Goldberg Clinic employs Clinical Epidemiology and Nutritional Biochemistry as two primary ways to evaluate our patients using the case history, physical exam and laboratory testing. We define the term “Nutrition”, differently than most. Nutrition involves all aspects of transforming nutrients into healthy human tissue and in eliminating wastes from the body. The Nutrition Process, therefore, is a transformation process that includes an appropriate diet for each stage of the patient’s healing process and of critical importance, the right steps to assure sound and efficient digestion, absorption, assimilation, cellular excretion and elimination. A comprehensive approach to optimizing health for the entire body is taken for all patients… not just dietary steps. Diet is but one important piece of the recovery process. 8) We do not view chronic, degenerative diseases as “incurable.” When the medical profession decrees a “disease” to be “incurable” that reflects their experience utilizing drugs as the foundation of patient care. Such a gloomy outlook does not necessarily apply when the right conditions of health are applied for the patient. 9) An important goal with each patient is the Re-Creation™ of body tissues involving the breaking down of old inferior tissues followed by renewal with superior, healthier tissues. 10) The Goldberg Clinic is a place for those willing to roll up their sleeves, discover the causes of their problems, address those problems logically and work with nature to reverse their chronic disease conditions.